A short, 4-6″, stoloniferous, dense, sod-forming, palatable native grass common to the prairies. It does not perform well in higher elevations or on sandy sites. Buffalograss sends out above-ground stolons which are quite aggressive once mature. Newer turf-type varieties are bred for disease resistance and a deeper green color. 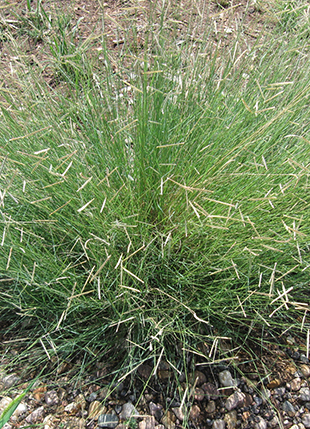 Buffalograss is a short, 4-6″, stoloniferous, dense, sod-forming, palatable native grass common to the prairies. It is long-lived, soft textured and either gray-green or blue-green in color. This warm season grass is commonly mixed with drought-tolerant Blue Grama in order to ensure solid color throughout the season. It does not perform well in higher elevations or on sandy sites. Buffalograss sends out above-ground stolons which are quite aggressive once mature. Newer turf-type varieties are bred for disease resistance and a deeper green color. May take 15 – 21 days or more to germinate. Keep seeds moist until germination which may mean watering several times a day and using a mulch. Pricing is for Improved II (good for pasture and rangeland applications), call for pricing on other varieties. With irrigation, the planting date can be extended into July and August. Fall plantings of untreated buffalograss seed are also successful, but maximum germination does not occur until the following spring. Treated seed planted in May will germinate in 10 to 14 days if moisture is adequate. Drill or rake in seed 1/4 – 1/2 inch into moist, fine soil that has been firmed down. Go over seeded soil with a roller to firm seed into the soil. Keep soil moist but not overly wet, until germination. A general rule of thumb (depending on the current climate) is to water daily for the first week, every other day for week two and every third-day week three.